Periodontal (gum) disease affects millions of adults in the US, and it is the leading cause of tooth loss for patients over the age of 35. Traditionally, gum disease is treated with more thorough cleanings and more frequent checkups. At Stephen H. Grossman, DMD Periodontics & Dental Implants in Acton, we offer patients advanced periodontal therapy using dental lasers to remove infection and promote healing. If you suffer from advanced periodontal disease, contact our team to schedule a consultation. Dr. Grossman will work with you to create a personalized treatment plan to fully renew oral health. Two of the most common laser dentistry treatments for gum disease suffers are scaling and root planing. These two treatments are typically performed at the same time. Laser scaling allows us to remove damaged gum tissue as well as plaque and tartar buildup below the gum line. Root planing smooths the surfaces of tooth roots to reduce the risk for further buildup of plaque and tartar. These treatments are traditionally completed using metal tools that can cause significant irritation and damage to soft tissue. Laser treatment makes these procedures completely painless, reduces risk for infection, and promotes complete, comfortable healing. LANAP, the acronym for “Laser Assisted New Attachment Procedure,” is used to assist gum and bone tissue in healing itself via laser energy. Dr. Stephen Grossman is one of the first six Massachusetts periodontists trained, certified, and licensed to perform the LANAP procedure, and 1 of only 1,400 dentists worldwide certified to perform this technique. There are many lasers on the market utilized to perform dental procedures. The Millennium Periolase MVP-7 is the only laser cleared by the A.D.A. to treat periodontal disease via the LANAP protocol. The LANAP laser selectively removes inflamed, diseased inner lining of periodontal pockets while keeping healthy tissue intact. Calculus, the hard accretions residing on the roots of teeth are then cleared with conventional instruments. Finally, hemostasis, the clotting of the blood, is attained by passing the laser energy again in the periodontal defect. An adjustment of one’s teeth by selectively grinding away dental interferences (which preclude regeneration) is performed at the end of this surgical procedure. An occlusal appliance, bite guard, which functions as a cast is often fabricated to be worn at night by the patient to protect and promote periodontal regeneration. Periodontal research, initially performed by Dr. Raymond A. Yukna in 2007 first demonstrated periodontal regeneration (formation of new cementum, periodontal ligament and bone) via the LANAP procedure. Other papers have been published supporting this state of the art technique. Continuing research and publications are expected to be released in the near future endorsing this revolutionary, non-invasive approach to treating periodontal disease without cutting or stitches. Once local anesthesia has been administered, our team measures the pockets between teeth and gums to gauge depth. During the first pass, the laser selectively removes bacteria from the pocket’s infected lining. An ultrasonic instrument cleans and smooths the surfaces of tooth roots. During the second pass, the laser further disinfects pockets and causes a clot to develop. After the second pass, we compress any loose tissue against the tooth, creating a fibrin seal. Your bite is adjusted to prevent traumatic tooth movement. Within 12 months, reattachment is complete. 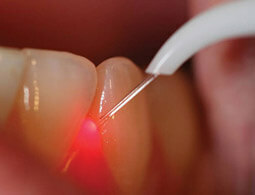 During your laser dental treatment, there will be little bleeding or discomfort. In fact, many patients report not feeling a thing. Within 48 hours following treatment, you will likely be fully healed and completely free from pain. If you do continue to experience pain, discomfort, irritation, or inflammation for a week or longer, you should call our team for a follow up appointment. There may be infection or other oral health concerns that need to be addressed.